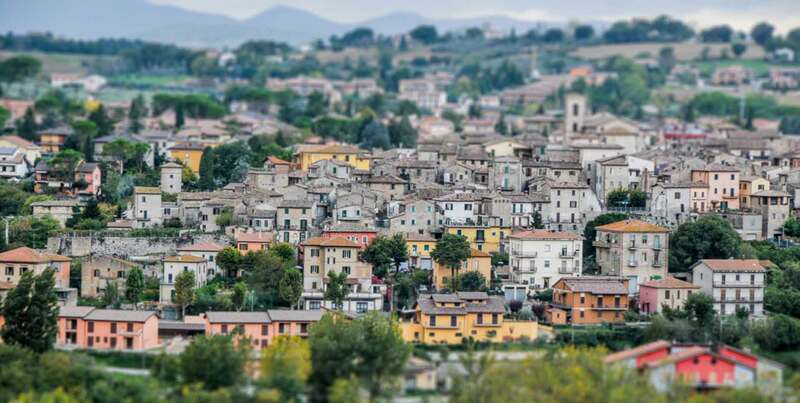 Spoleto is one of our favourite cities in Umbria and is really a wonderful place to visit with lots of great restaurants, cafes, shops and loads to see. Have a look at our Image Galleries of Umbria for more pictures of Spoleto. One thing that is spoiling Spoleto at the moment is the extensive renovations being carried out on many of the buildings and streets. Spoleto (Latin Spoletium) is an ancient city in the Italian province of Perugia in east central Umbria on a foothill of the Apennines. Spoleto was situated on the eastern branch of the Via Flaminia, which forked into two roads at Narni and rejoined at Forum Flaminii, near Foligno. An ancient road also ran hence to Nursia. Located at the head of a large, broad valley, surrounded by mountains, Spoleto has long occupied a strategic geographical position. It appears to have been an important town to the original Umbri tribes, who built walls around their settlement in the 5th century BC, some of which are visible today. The first historical mention of Spoleto is the notice of the foundation of a colony there in 241 BC. and it was still, according to Cicero (Pro Balbo), colonia latina in primis firma et illustris: a Latin colony in 95 BC. After the Battle of Lake Trasimene (217 BC) la Spoletium was attacked by Hannibal, who was repulsed by the inhabitants. During the Second Punic War, the city was a useful ally to Rome. It suffered greatly during the civil wars of Marius and Sulla. The latter, after his victory over Crassus, confiscated the territory of Spoletium (82 BC). From this time forth it was a municipium. Under the Lombards, Spoleto became the capital of an independent duchy, the Duchy of Spoleto (from 570), and its dukes ruled a considerable part of central Italy. In 774, it became part of Holy Roman Empire. Together with other fiefs, it was bequeathed to Pope Gregory VII by the powerful countess Matilda of Tuscany, but for some time struggled to maintain its independence. In 1155, it was destroyed by Frederick Barbarossa. In 1213, it was definitively occupied by Pope Gregory IX. During the absence of the papal court in Avignon, it was prey to the struggles between Guelphs and Ghibellines, until in 1354 Cardinal Albornoz brought it once more under the authority of the Papal States. Santa Maria della Manna d’Oro, is an edifice on an octagonal plan sited near the Cathedral. It was built in the 16th-17th century to thank the Madonna for her protection of Spoletine traders.